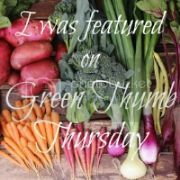 The Green Phone Booth: Stop and smell the... strawberries! Fun! Our pick-you-own farm just opened here (Colorado) this month and I've been dying to go. 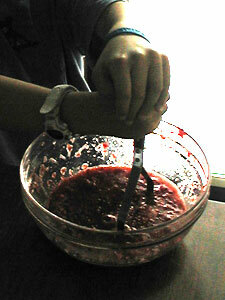 That's very interesting about the with-sugar version making more jars of jam. 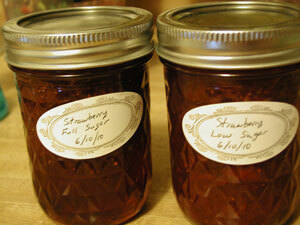 How many jars did each version make, and what kind of pectin did you use? The regular-sugar jam was made with Certo Liquid Fruit Pectin (mostly because we still had a packet left after making Violet Jelly a few weeks ago). It yielded 6 8-oz jars and 1 16-oz jar, with about 5 oz left over. The no-sugar jam (which actually has some sugar in it) was made with Ball No Sugar Needed pectin. That recipe produced 6 8-oz jars, with about 4 oz left over. The flavors are a little different - the no-sugar jam has an additional flavor which we couldn't quite nail. It's not bad, just a little unexpected. The regular jam is still soup today, so it's obviously not going to jell up any further. Yes, it could be recooked, but we're just going to leave it as it is. There's also a texture difference - the no-sugar jam is firm, but not in the way I remember the firm jam my mother used to make. It almost seemed a little gelatinous, firm, but not stiff. As we discussed our findings, we thought we'd try a batch of jam with even less sugar (not strawberry, it's too late to get more berries... maybe blueberry?). But, as of this moment - our minds are open to change - we'll probably stick with the regular sugar recipes in general.